A double and triple top /bottom pattern is much similar to a Head & Shoulder (top/bottom) pattern in the sense that a price violation above or below (depending on the pattern) the neckline confirms the pattern. However, unlike a Head & Shoulder pattern, the peaks and troughs in the double and triple top/bottom formations are of approximately equal height. A trader who is well accustomed in identifying a Head & Shoulder pattern discussed in our earlier article would find it easy to locate a Double and Triple top/bottom patterns on a chart. Once located, a trader can capitalize on the impending movement by trading a suitable binary option contract. However, an important point to remember is that a double and triple top/bottom pattern has a success rate of less than 50%. The highest price in the second peak would be in the range of 3% to 4% from the high of the first trough. There will be a 10% to 20% decline from the first peak. The second peak should not be taller than the first peak. Traded volume should increase when the price breaks below the neckline (reaction lows / support level). There should be a time gap of at least few weeks between the formation of the first and second peak. A binary option trader can purchase a put option with expiry period of 1min, 30min or 1hr, once the reaction low, which acts as the support level, is broken. Since a double top formation can extend into a triple top pattern, a conservative entry is always recommended to beginners. On the other hand, after the formation of the second peak, a high risk trader should watch for a rise in volume during the decline in price. If the volume and momentum increases considerably during the decline then a put option can be purchased with the expectation of a break-down below the support level. Once the neckline is broken, a conservative trader should act very quickly as the price decline will be sharp. Since entry price matters a lot in binary options trade, all details (probable target price and order size) related to the trade should be kept ready while monitoring for a break-down. As far as a confirmed double top pattern is concerned, there is almost negligible chance of reversal before the expiry of 1min, 30min or 1hr options contract. Any unexpected news favoring a price rise would result in a trend reversal thereby making the binary options contract expire out of money. Volume: Should be remarkably higher when the price breaks below the reaction low. Momentum should be strong as well. Probable price target: The one touch put option price target set by the broker should be comparable to the probable price target calculated using the distance between the neckline and the peak price. 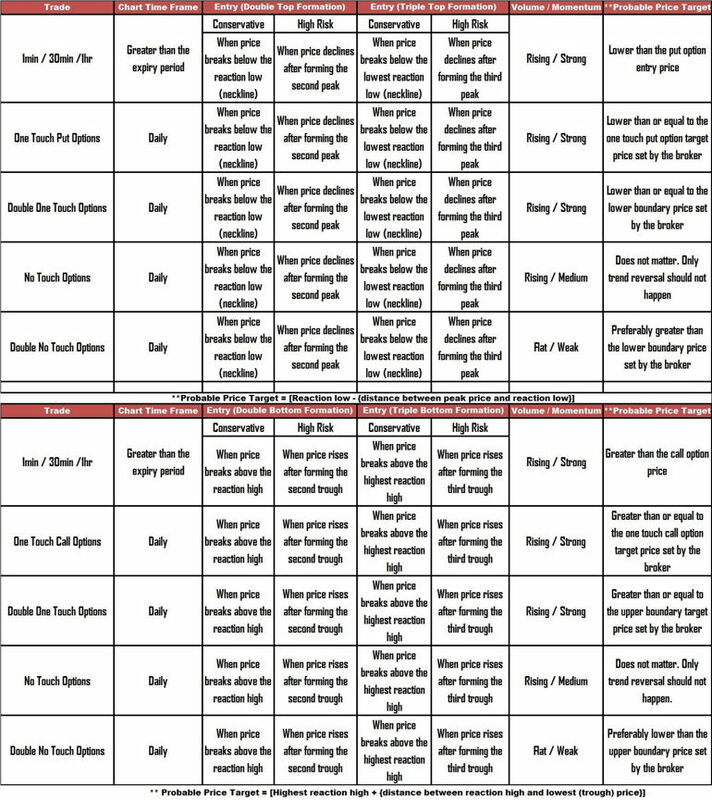 If the above requisites are satisfied then a one touch options trade can be taken with confidence. A high risk trader can enter a trade when the price declines after forming the second peak. The volume should be distinctively higher than what it was earlier. If not, the pattern may extend into a trip top formation. If the price decline is not steep enough to touch the one touch put option target price set by the broker then the contract will expire out of money. Instead of a one touch put option, a binary options trader can buy a double one touch options contract when the price breaks the support level of a double top formation. The double one touch options contract should be considered only when there is a major news announcement, which can force the price steeply in any direction. Similar to a one touch put options trade, the volume should noticeably increase for entering into a double one touch options trade as well. The contract will end in the money as long as the momentum favors a strong price reversal or further decline in price. Only a stunted price movement will result in a loss. A high-risk trader can enter a double one touch options trade when the price starts declining (with a rise in volume) after the second peak formation. If a trader is confident of the double top pattern then a ‘no touch option contract’ can be bought under two situations. To add up to the existing one touch put options trade. If the price reverses due to unexpected news then there will be a loss in both the trades. When the momentum is not strong then a trader would be in a dilemma as to whether the decline would be deep enough to reach the price target (for one touch put options) set by the broker. Under such circumstances a no touch options trade can be purchased. As long as the price does not reverse, a trade taken after the breakdown of the neckline of a double top pattern will result in a profit. Since there is no price target to be hit during decline, a trader can be devoid of worry as long as the price does not show signs of reversal. Similar to other binary option trades, a high risk trader can enter a no touch options trade when the price declines after the formation of the second peak. Needless to say that volume should rise along with a favorable momentum. If the price remains range bound because of weak momentum and lack of rise in volume, a trader can purchase a double no touch options contract. As long as the momentum and volume scenario remains unchanged, the trade will expire in the money. Any high impact news announcement can lead to an abrupt rise in volume coupled with a gain in momentum. Under such circumstances, the trade will end in a loss because of a sharp decline or reversal in price. A double bottom is a bullish reversal pattern seen at the end of a price down trend. A confirmed double bottom pattern is ‘W’ shaped and results in a quick price reversal. The lowest price in the second trough would be in the range of 3% to 4% from the low of the first trough. There will be a 10% to 20% recovery from the first low. The second trough, under no case, should be lower than the first trough. Volume should rise along with the break above the neckline (resistance/reaction highs). There should be at least a time gap of few weeks between the first and second trough formation. The characteristics of a double bottom pattern are similar to that of a double top pattern. However, the price breaks above the neckline thereby ending the prevailing downward trend. Thus, all binary option trades can be taken (as described in the image below) when the price breaks above the reaction high (neckline). A triple top is a bearish reversal pattern, which develops after a prolonged uptrend in the price of an asset. Obviously, as the resistance remains intact after being tested for three times, this rarely seen pattern is much more reliable than a double top pattern. A triple top pattern is made up of three consecutive stand alone peaks of rarely equal spacing. A break below the lowest reaction low initiates a downtrend in price. A triple top pattern should satisfy the following conditions. The triple highs should be more or less the same. The volume should increase when the price breaks below the reaction low (support line). In the case of a triple top pattern, once the lowest of the reaction low is convincingly broken, a binary options trader can purchase a put option with an expiry period of 1min, 30min or 1hr. It should be remembered that the volume will not show any formidable rise when the price starts declining after the formation of the second peak. This technicality sets it apart from a double top pattern and indicates that another peak is very much a possibility. So, a trader must show patience while trading a triple top pattern. The volume will start rising after the formation of the third peak. A conservative trader can enter a binary option trade with expiry of 1min, 30min or 1hr once the lowest of the reaction low is broken. High-risk traders can enter a binary options trade as soon as they can identify an appreciable rise in the volume during the decline after the formation of the third peak. The price decline, after the neckline is broken, will be rapid. Thus a conservative trader should not waste any time in entering a trade. Once the support level is broken, there is a very little chance for a trend reversal within the expiry period. Thus, the probability of success is higher if the entry is made at the right time. Only unexpected news triggering a trend reversal can result in a loss. Volume: The volume should be significantly higher when the price starts declining after the formation of the third top. The momentum should complement the volume. Probable price target: The put option price target set by the binary options broker should be greater than or equal to the probable price decline calculated using the distance between the peak price and the lowest reaction low in the pattern. As mentioned earlier, a high risk trader can purchase a one touch put options contract when the price starts falling after the formation of the third peak. However, it must be remembered that the volume should be rising during the price decline. If otherwise, a trader should restrain from entering the trade. If the decline is not deep enough to hit the price target set by the broker then the trade will result in a loss. Instead of a one touch put option, a binary options trader can buy a double one touch options contract when the price breaks the support level of a triple top formation. The double one touch options contract should be bought only when there is a scheduled news announcement, which is expected to increase volatility. Again, the volume should appreciably increase during the break-down of the lowest reaction low. The contract will end in the money as long as the momentum is strong enough to fuel a decline in price or trigger a sharp price reversal. Only a halted price movement will result in a loss of trade. A high risk trader can enter the trade when the price starts declining after the formation of the third top. A confirmed triple top pattern can be used to enter a ‘no touch option contract’ as per the details below. 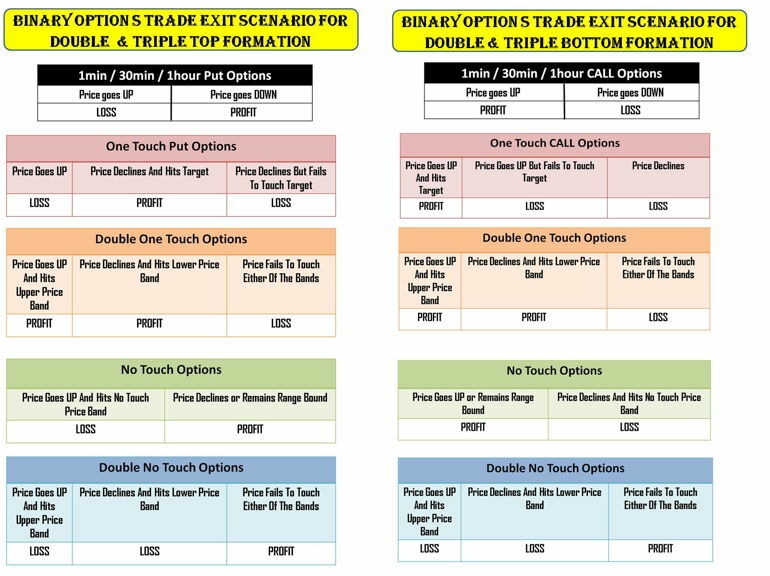 To make magnificent gains from the trade, a no touch options trade can be combined with an existing one touch put options trade. If the price reverses due to unexpected news then there will be a loss in both the trades. If the momentum is not strong (and volume is not appealing) then a trader would not be sure as to whether the decline (after breaking the lowest reaction low of the triple top pattern) would reach the price target (for one touch put option) set by the broker. Under such circumstances a no touch options trade can be purchased. As long as there is no trend reversal, a trade taken after the breakdown of the neckline of a triple top pattern will expire in the money. With no target price to be achieved, a trader can remain comfortable after taking the trade as long as the price does not show signs of reversal. Similar to other binary option trades, a high risk trader can enter a no touch options trade during the price decline after the formation of the third peak. Volume should be rising along with a favorable momentum. Only when the price remains range bound (weak momentum and lack of rise in volume) after breaking the neckline (lowest reaction low) of a triple top formation, a trader should consider taking a double no touch options trade. As long as the momentum and volume scenario remains bleak, the trade will end up in a profit. A rise in volume accompanied by a gain in momentum would result in a sharp decline or major reversal and ultimately the contract will expire out of money. The triple lows should be more or less the same with a clear distinction of turn-around points. The volume should increase when the price breaks above the reaction high. A triple bottom pattern exhibits characteristics similar to that of a triple top pattern. The only difference is that a triple bottom pattern is a bullish reversal pattern. Thus, the price would break above the neckline thereby triggering an uptrend. Thus, all binary option trades, as shown in the tabular column above, can be taken when the neckline is broken. Even though, the details discussed here looks complex, practically, binary option trades can be taken with relative ease and confidence as long as a trader can identify the pattern (and neckline). Additionally, a trader should develop the capability to trade a suitable binary option contract.